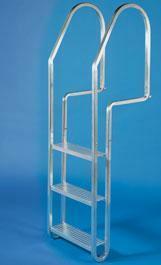 This Dock Edge ladder is manufactured with 1” heavy wall aluminum tubing and has 5 steps. All assembly hardware is stainless steel and assembly is quick and easy. An optional quick release kit is included. Simply tilt the ladder up and slide it out for storage and cleaning, or mount the ladder permanently with it's pre-drilled holes. The dimensions of this ladder are: 18.5in. x 3.75in. x 14in.